These days it isn't enough to know what type of vehicle you want to purchase or lease. You need to head to your local dealership and really take a closer look at everything both inside and out. Not to mention, a test drive will really seal the deal on a vehicle that you are strongly considering. The Dodge Journey is a vehicle that stands out on our lot from all of the other Dodge vehicles that we have on hand at any given time. It has a very unique design that is meant to stand out, but the design of the Journey is also intended to be very functional. 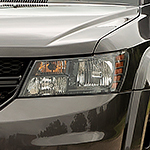 We love the classic crosshair grille that everybody recognizes as being a Dodge vehicle. You can upgrade this item to be a glossy black and couple it with chrome accents for a classier look. Don't forget about the optional dual exhausts and black head lamp bezels.